Close-up of Seth_01, the most active pit on the surface of comet 67P/Churyumov-Gerasimenko, which is about 200 meters in diameter and 200 meters deep. 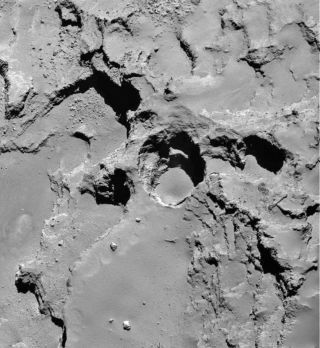 The Rosetta spacecraft's images of the comet suggest that the round pits on its surface form as sinkholes. Strange pits and divots observed on the surface of Comet 67P/Churyumov-Gerasimenko may be sinkholes, not unlike those that appear on Earth, a new analysis suggests. Images of the comet taken by the European Space Agency's Rosetta probe show the object's surface is spotted with flat-bottomed pits that are emitting jets of gas. New research reveals how the steep divots could be created by melting ice under the comet's surface, which creates empty spaces that can suddenly cave in. The new research suggests that when subsurface ice melts and the empty spaces suddenly cave in, new parts of the comet become exposed to the sun's glare and heat up. This additional heat can generate gases inside the comet that escape as jets. The researchers say that understanding the sinkholes' formation might help determine the comet's makeup and age. This close-up image shows the most active pit, known as Seth_01, observed on the surface of comet 67P/Churyumov-Gerasimenko by the Rosetta spacecraft. "Now, for the first time, we have a clear link between jets and between these pits that we have observed on the surface," Jean-Baptiste Vincent, a planetary scientist at the Max Planck Institute for Solar System Research in Germany, told Space.com "And it's also telling us a lot of things about the evolution of the comet and about the inner structure." Vincent is first author on the new research, which was published online today (July 1) in the journal Nature. Photos of the comet revealed two types of pits: There are shallower pits, with more gradual, sloping sides. And there are pits with deep, nearly vertical walls, which create empty cylinders in the ground. Jets of material fly out of these steep pits' sides, and researchers originally thought this was evidence that explosions were creating the pits. But now the scientists say that cannot be the case. "The small jets that you see, it could take them forever to carve the pits that we observe now," Vincent said. The new analysis of data from Rosetta suggests instead that the pits form when the roof of an empty space in the comet collapses, similar to sinkholes that form on Earth and Mars. Vincent said that the voids could come from ice within the comet's core turning to gas and escaping after exposure to heat. Then, the newly exposed walls of the pits begin to react in the sunlight by releasing material in jets, slowly collapsing and flattening them over time. If found on other comets, the pits could offer insight into the makeup of those objects' cores, as well as serving as a sign of age or exposure to the sun: the longer a comet was exposed to sunlight, the more worn away the pits would be. "We think it's a common process. It's happening on all comets — maybe on slightly different timescales, but we think it's happening everywhere," Vincent said. "We're able to make a discovery like this now because Rosetta is a rendezvous mission, and everything before has been flybys," Paul Weissman, a researcher at NASA's Jet Propulsion Laboratory in Pasadena, California, who wrote a commentary about the new paper in the same issue of Nature, told Space.com. "We're literally orbiting the comet at walking speed, typically a meter a second or less," Weissman added. "And so this gives us the opportunity to stay there, see changes occurring, see what happens to the comet as it losses mass, as different areas come into sunlight and get active." As of June 23, the Rosetta mission has been extended until September 2016, so the spacecraft will be able to continue investigating Comet 67P after the space rock reaches its closest point to the sun next month and moves away again. Rosetta will keep gathering more detailed images and measurements. In the meantime, researchers will continue to scrutinize the existing data for details about the comet's formation and composition. "And there's still going to be surprises to come, I think," Weissman said.